The 3 Valleys can offer something that no other ski area in the world has - fantastic skiing and top-class restaurants, an astonishing yet obvious combination. After the pleasures of the slopes, what could be better than treating your taste buds at one of these top-class eateries? The surest way to make your skiing trip an unforgettable experience. Just picture this - you decide to get up early for a full morning's skiing. The sun's shining, the snow's crisp, the slopes are groomed to perfection. The resort is your oyster! You and your friends (a pleasure shared is a pleasure doubled) do some warm-up routines before setting off at full throttle! How can you resist the call of the deserted early-morning runs? Your eyes boggle at the sensational views, you soak up the thrills and breathe in the pure air, your entire body tingles with excitement. You challenge each other to a carving contest to see who can carve the purest track on the freshly groomed snow, or who can devour the most altitude in a single run before your legs start to protest and you have to take a break. And then, as if by chance (you actually checked out the route the day before without telling your friends), you choose to end this wonderful morning on one of our "Michelin-star runs", which brings you right to the doorstep of one of our restaurants that proudly bear one or more Michelin rosettes. You take off your skis, stow them away and push open the door… into a whole new world. From the invigorating white majesty of the mountains you pass into the muffled quiet of a high temple of gastronomy. The contrast is breathtaking! Before they realise what's happening, your friends are sat at a table, still in their ski gear (comfortable slippers have taken the place of their boots), while waiters tend to their every need, welcoming you with an appetiser which is just a prelude to what will follow - an exquisite gastronomic pleasure… Some time later, body and soul rested, all you have to do is put your skis back on for a more sedate afternoon's skiing, a leisurely digestive foray into the 3 Valleys. You may hardly believe what has happened, but this is no dream - you've just had an incomparable 3 Valleys experience. No other resort can make dreams like this a reality. Take one incomparable ski area, add a generous helping of world-class French cuisine, shake vigorously to combine the joys of snowsports with those of the palate and prepare yourself for a pleasure-filled week! Les 3 Vallées has put together a gourmet week you won't forget in a hurry. Ski to restaurants run by Michelin-starred chefs. And non-skiers needn't fret, all of these restaurants can of course be reached by more conventional means. So whether you're a skier or not there's not a second to lose, come and sample the finest cuisine the 3 Valleys has to offer. And don't forget that they all offer "Menus Skieurs"; lunchtime set menus offering unbeatable value for money! An example of pistes leading to the Stars? How to get there: from Val Thorens, head for Le Mont de la Chambre and cross over into Méribel-Mottaret and then on to the top of La Saulire. Then just head down into Courchevel 1850: Le Chabichou can be reached via the green piste running between the Stade ski tow and the Plantrey chairlift. Originally from the neighbouring Ardèche region, Michel Rochedy first came to Courchevel in 1963, determined to open a top-class restaurant at a time when Savoie gastronomy consisted mainly of the fondue and the no less ubiquitous "diots aux crozets" (sausage and grits)…. . 45 years and two Michelin stars later, Le Chabichou boasts a master head chef and a no less brilliant sous-chef. For Monsieur Rochedy's right-hand man is none other than Stéphane Buron, winner of the Taittinger 2002 international culinary award and "Meilleur Ouvrier de France", an award recognising the country's top craftsmen. The fine cuisine on offer at Le Chabichou scuppers the theory that creativity is solely the preserve of the young! The establishment's motto is "Imaginative cuisine to delight both the palate and the eyes". Prices: set menus ranging from €60 to €220 (drinks not included). How to get there: from Saint Martin de Belleville, head for the top of Tougnète and cross over into Méribel-Mottaret. Up to the top of La Saulire and then cross over to Les Creux, back up on the Vizelle lift and then ski down Combe de Saulire to Les Coqs. From there just take the sledge-run-like Folières piste over to La Tania and the restaurant Le Farçon is on the left-hand side of the snow front. This father-and-son team can remember their first day as if it were yesterday. "We opened on 27 December 1990 at 5 o'clock in the afternoon! La Tania only had one apartment building in those days, and our first restaurant was … a crêperie!" Just five years ago, the younger Machet, Julien, decided he wanted to turn the family's pancake house into a cordon bleu establishment. Born and raised locally, Julien found inspiration in his roots, creating dishes featuring basic local ingredients subtly revisited and married with flavours from further afield. Such as his now famous hay sorbet, using the earliest shoots of hay that his grandmother used to pick at the beginning of each harvest. Both father and son admit to having been surprised to receive recognition from the famous Red Guide. According to Julien, "We didn't even know we'd been awarded a star - it was a customer who told us!" His father and mentor adds, not without a tinge of pride in his son's achievements, "From a bog standard diner, we've created something wonderful but unpretentious". A restaurant in the image of its creators! Prices: set menus ranging from €30 to €120 (drinks not included). Le Bateau Ivre is only open in the evening. At lunchtime, Jean-Pierre Jacob plies his trade on the terrace of the Pomme de Pin Hotel, home to Le Bateau Ivre on the top floor. How to get there: from Brides-Les-Bains, head for the top of the Roc de Fer and do an Olympic-style warm up by taking on La Face, before coming back up and switching over to the Saint Martin 2 chairlift. From the top of Tougnète, head back towards Méribel and then to the Col de La Loze. Ski down to Le Praz and come back up on the Forêt gondola. Then all you have to do is head for the Courchevel 1850 slalom stadium. The La Pomme de Pin hotel is on your left. Born in nearby Bourget-du-Lac, where he first plied his trade at his father's side, Jean-Pierre Jacob is a man who relishes a challenge - and running two top-class establishments with brio, ferrying between the Lac du Bourget in the summer and Courchevel in the winter represented the mother of all challenges! But Jean-Pierre Jacob was more than equal to the task, and with each of his restaurants achieving two Michelin rosettes, he's the most decorated chef in all of Savoy! But his taste for a challenge does not detract from his respect for the produce and for tradition. Another reason Le Bateau Ivre has two incarnations is to adhere strictly to seasonal variations in the local ingredients. If he could put his finger on the reason why he would never envisage exercising his talents in any other part of France, it would almost certainly be the variety and, above all, the quality of the produce to be found in Savoie. He freely acknowledges that one of the keys to his success is the intimate knowledge he has acquired of the origins of the produce he uses and of the farmers he works with. There's no doubt in his mind that in the mountains, more than anywhere else, trusted suppliers are an absolute necessity. Prices: set menus ranging from €60 to €190 (drinks not included). How to get there: from Méribel, head for the top of Tougnète, cross over to Les Granges and then up to the Roc des 3 Marches. Carry on to Les Menuires, cross the resort and head for the top of La Masse. Descend by the itinerary of your choice and then jump on the Reberty lift, and then Bruyères I and II. From the top of the Mont de la Chambre, cross back over to Val Thorens. Stay on this side of the mountain without crossing the resort until you cross the last ski bridge. L'Oxalys is on your left, inside the building of the same name. Born in Aix les Bains, Jean Sulpice is a Savoyard through and through and could never have imagined himself exercising his talents anywhere but in his native region. In late October/early November, before cooking begins to monopolise his time, he likes to enjoy the intimate atmosphere that reigns in the mountains before the start of the new winter season. His favourite pastime is ski touring, and he thinks nothing of rising at the crack of dawn for a short trip in the calm of the early morning before donning his apron…it must be at times like this when, filling his lungs with oxygen, he finds the inspiration for his art. 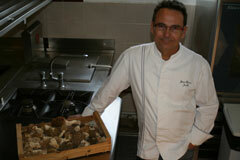 His cuisine is mostly based on local plants and produce, which he mixes and reinterprets to his customers' delight. "The chef's mission is to showcase local produce." Mission accomplished, despite the challenge presented by opening a gastronomic restaurant at an altitude of 2,300 m, with everything that involves in terms of mastering new cooking times and coping with the dry winter air. And if that were not enough, the young chef also has the sword of Damocles hanging over his head all winter in the form of the threat of a freak snowstorm cutting off the Val Thorens road and thus his supply of fresh produce… As the saying goes, "If you can't stand the heat, stay out of the kitchen." But the heat of the kitchen is exactly where the tenacious Jean Sulpice lives and thrives. Prices: set menus ranging from €43 to €105 (drinks not included). How to get there: from Courchevel 1850, head to the top of La Saulire and down to Méribel-Mottaret. On your way, enjoy a wonderfully smooth run on the immaculate snow of Mont Vallon via the Combes and Chatelet chairlifts. Then it's back up Mont de la Chambre and to the La Becca lift. From the top, take La Becca followed by La Pelozet piste, heading for Saint Martin. You can now either stop at the Les Menuires road and take the La Bouitte shuttle bus or traverse off piste to the left of the gondola lift and descend to Saint Marcel. The restaurant is opposite you on the other side of the road. Will La Bouitte be the first 3-star restaurant in the 3 Valleys? The Meilleur family certainly has its sights firmly set on making that happen. Son Maxime puts it as follows, "We're going for Olympic gold! 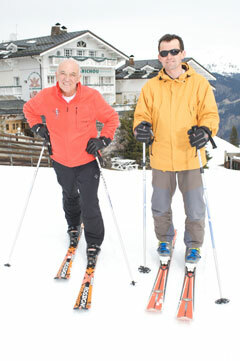 When I was younger, I was a competitive skier and all I wanted was to give my very best." This required painstaking work, all day, every day. "I remember once rejecting a batch of white truffles delivered by a supplier. But leaving them off the menu was not an option, so he had to sacrifice his own personal stock and taxi it to us, in person, at the eleventh hour. He got here with a few minutes to spare before we started serving, to a round of applause from our customers!" Such exacting standards have since borne fruit since La Bouitte is one of just eight restaurants to have received a second star in 2008. For the eighth consecutive year, Les Menuires is celebrating French wines. Some thirty winemakers from all of France's regions will be presenting their wares at special "Vins de France" wine-tasting evenings open to all. And since high altitude is greatly beneficial to red wines and champagne, refining and enriching their bouquet, it would be a shame to miss this opportunity to build up your collection of fine wines, which you should keep in the resort. And be warned, it takes at least three weeks for the altitude to start having its effect. Europe's highest ski resort will be playing host to a highly original culinary event, organised at the initiative of Jean Sulpice (head chef at L'Oxalys, the Michelin-starred restaurant at Val Thorens). No fewer than seventy master chefs, food and wine producers, journalists and top sportsmen and women will be converging on the resort to take part in a truly unique week of activities combining sport and gastronomy. All with a passion for the mountains and skiing, the participants will be competing in 10 teams of 6 in special events designed around the themes of sport and top-class cuisine. This first year of the Critérium des Chefs will feature meals created by Savoie's top chefs and, between each sports event, special gastronomic relays will be held, with members of the public being offered the chance to taste local produce both in the resort and at the tops of the slopes. The atmosphere will be relaxed and festive, and proceedings will come to a close with two culinary workshops and a final lunch at an altitude of 3200 metres. Let the party begin! Le Génépi (2 "knife and fork" symbols in the Michelin and 13/20 in the Gault et Millau): Typical Alpine décor and classic cuisine that avoids the excesses of higher-class, trendier eating houses. La Saulire (2 "knife and fork" symbols in the Michelin and 13/20 in the Gault et Millau): Inimitable atmosphere - jet set but still authentic. La Fromagerie (1 "knife and fork" symbol in the Michelin): Cheese-based regional specialities in a typical Alpine dining room. La Table du Jardin Alpin (11/20 in the Gault et Millau): International cuisine and a sumptuous wine cellar. La Table du Jardin Alpin (11/20 in the Gault et Millau): Good-humoured, friendly service and warm Alpine décor. L'Allodis (14/20 in the Gault et Millau): A stalwart here for over 15 years, Alain Plouzané blends traditional local produce with fine foods. Attached to the hotel of the same name. At the halfway point of the Rhodos gondola lift, in the Belvédère district. Tel. +33 (0)4 79 00 56 00. Le Blanchot (2 "knife and fork" symbols in the Michelin and 12/20 in the Gault et Millau): Christophe Perrin finds inspiration for new ideas all around the world, especially in Asia, while preserving the French "bistro spirit" with his old classics. Next to the Lapin piste, after the Altiport piste. Le Grenier (12/20 in the Gault et Millau): Either in the pretty first-floor Alpine dining room or on the terrace next to the Saint Martin de Belleville pistes, enjoy traditional fare with a subtle gastronomic twist. Le Montagnard (1 "knife and fork" symbol in the Michelin and 11/20 in the Gault et Millau): Just the ticket for those looking for something more than a mountain café-bar. At the foot of the Granges ski tow in the heart of Saint Martin de Belleville. L'Etoile des Neiges (2 "knife and fork" symbols in the Michelin): Traditional fare and a pleasant sunny terrace. In the centre of Saint Martin de Belleville, close to the church. Le Bellevillois (12/20 in the Gault et Millau): This young chef seeks to adhere to regional traditions while at the same time catering for the general tastes of holidaymakers from all parts, adding a fashionable twist to his creations. L'Epicurien (12/20 in the Gault et Millau): Frédéric Tarride delights in taking prestigious ingredients and giving them a personal touch. Le Galoubet (10/20 in the Gault et Millau): This brasserie at one end of the Caron shopping centre has one of the most splendid Alpine dining terraces you could ever find.